The national tests will become more flexible, Mr Balls said. The children's minister said some set subjects and "clutter" would be cut to allow more flexibility and all primary pupils to be taught a foreign language. 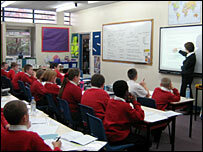 It is part of a 10-year children's plan to be unveiled this week which aims to make the school system "world class". The plan will also look at issues such as advertising's impact on children. It will look at evidence of links between adverts and dissatisfaction, anxiety, eating disorders and drinking. Children see some 10,000 TV adverts a year and recognise 400 brands by age 10, Mr Ed Balls says. He said many parents were concerned about youngsters being bombarded with adverts and media images that encouraged the "sexualisation" of girls. Mr Balls said the inquiry would be carried out by leading child psychologists and academics. They would see whether commercial pressure had a "negative impact". "We need to look at the evidence around commercialisation before we jump to any conclusions," he said. Mr Balls said he would not rule out introducing new regulations, but stopped short of suggesting a ban on alcohol advertising before the 9pm watershed. The details of the inquiry and the rest of the 10-year children's plan are due to be announced by Mr Balls on Tuesday. It is set to look at all aspects of children's lives and could include changes in the design of schools, as well as attempts to get parents more directly involved in school activities and to improve the provision of safe play areas. It is expected to include an announcement of free nursery care for children as young as two from poorer families. He told the BBC's Sunday AM that English primary school tests would stay - but that they might become more flexible in timing, so pupils take them when they are ready rather than at a fixed date. "It is time for a change... away from the rigidity... so it is more in line with the needs of the child," he said. This would be more popular with parents and teachers while still giving comparative data for schools, Mr Balls added. The review of the primary school curriculum, which he said would be the first for more than a decade, would be carried out by Jim Rose. Mr Balls denied that it was an acknowledgement of failure to be drawing up such plans after 10 years in power. He said education levels had increased over the past decade from "below average to above average" but the aim now was to make it "world class". He also denied that the past few weeks had been disastrous for Prime Minister Gordon Brown. "The fact is people are not going to judge the next election on what happened at PMQs (prime minister's questions) in October... they are going to judge it on who's got the vision for the future, who's got the policies to match." Why are we such worried parents?